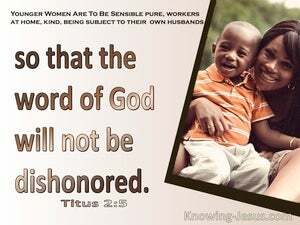 ﻿ Titus 2:5 to be sensible, pure, workers at home, kind, being subject to their own husbands, so that the word of God will not be dishonored. to be sensible, pure, workers at home, kind, being subject to their own husbands, so that the word of God will not be dishonored. to be sensible and pure, to manage their households, to be kind, and to submit themselves to their husbands. Otherwise, the word of God may be discredited. to be serious-minded, pure, homemakers, good, submissive to their own husbands, so that the word of God may not be blasphemed. To be self-controlled, chaste, homemakers, good-natured (kindhearted), adapting and subordinating themselves to their husbands, that the word of God may not be exposed to reproach (blasphemed or discredited). to be sensible, [morally] pure, [good] homemakers, kind [and] in subjection to their own husbands, so that God's message will not be spoken against. to be discreet, chaste, fond of home, good, obedient to their own husbands, that the word of God be not reviled. To be wise in mind, clean in heart, kind; working in their houses, living under the authority of their husbands; so that no evil may be said of the word of God. to be prudent, chaste, domestic, good, submissive to their own husbands, in order that the word of God may not be blasphemed. and to be sensible, pure-minded, domestic, kind, and submissive to their husbands, so as not to bring reproach on God's message. to love their chidren, Discreet, chaste, keepers at home, good, obedient to their own husbands, that the word of God be not blasphemed. to be temperate, chaste, good housekeepers, subject to their own husbands, that the word of God not be blasphemed. Of sound mind chaste, remaining at home, good subordinates to their own husbands, that the word of God be not defamed. [to be] self-controlled, pure, busy at home, good, being subject to their own husbands, in order that the word of God may not be slandered. to be discreet, chaste, keepers at home, good, subject to their own husbands, that the Word of God may not be blasphemed. to be of discreet, chaste, housewifely, good, and obedient unto their own husbands, that the word of God be not evil spoken of. to be mistress of themselves, chaste, domestic, kind, and submissive to their husbands ? ?otherwise it will be a scandal to the gospel. to be sober-minded, chaste, workers at home, kind and submissive to their husbands, in order that God's message be not maligned. to be self-controlled, pure, fulfilling their duties at home, kind, being subject to their own husbands, so that the message of God may not be discredited. to be sober minded, chaste, workers at home, kind, being in subjection to their own husbands, that God's word may not be blasphemed. to be discreet, chaste, workers at home, good, in subjection to their own husbands, that the word of God be not blasphemed. sober, pure, fond of home, kind, subject to their husbands, that the word of God may not be blasphemed. to be sober, domestic, good, obedient to their own husbands, that the word of God be not ill reported of. and to be discreet, pure-minded, domesticated, good women, ready to submit to their husbands, in order that God's Message may not be maligned. industrious in their homes, kind, submissive to their husbands, so that the Christian teaching may not be exposed to reproach. to be serious, pure, home keepers, kind, and subordinate to their husbands, so as not to cause God's message to suffer reproach. to be sober, pure, workers at home, good, submitting themselves to their own husbands, that the word of God be not blasphemed. chaste, keepers at home, good, submissive to their husbands, that the word of God may not be evil spoken of. sober, pure, keepers of their own houses, good, subject to their own husbands, that the word of God may not be evil spoken of. He said, "Hagar, Sarai's maid, where have you come from and where are you going?" And she said, "I am fleeing from the presence of my mistress Sarai." Then they said to him, "Where is Sarah your wife?" And he said, "There, in the tent." "However, because by this deed you have given occasion to the enemies of the LORD to blaspheme, the child also that is born to you shall surely die."